Residents have closed more than 2,000 streets in Ciudad Juarez, the city in Mexico most affected by drug prohibition violence. About 200 families have been wiped out in 10 zones heavily affected by the drug prohibition war. 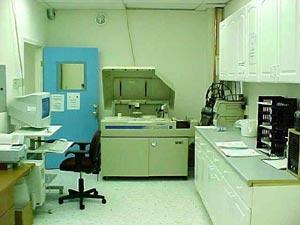 drug testing lab -- corporate welfare carrying out an ineffective strategy? Critics of welfare drug testing cite unconstitutionality of warrantless drug testing, the cost of drug testing tens or hundreds of thousands of people, counterproductive results and mean-spiritedness in opposing legislation that would require it. But that hasn't stopped legislators from coming back again and again. With this year's state legislative season barely under way, bills have been introduced in four states -- Kentucky, Missouri, Nebraska, and Oregon -- to require drug testing for people receiving public assistance. And in a novel twist, a bill in Indiana would require unemployment recipients to declare they are not using illegal drugs and threatens them with up to three years in prison for perjury if they are found to be using them. But while such bills may be popular with politicians of a certain stripe, they don't find much support among professionals in the field. Groups that have lined up against such bills include the American Public Health Association, the National Association of Social Workers, the National Association of Alcoholism and Drug Abuse Counselors, the American College of Obstetricians and Gynecologists, the National Council on Alcoholism and Drug Dependence, the Association of Maternal and Child Health Programs, the Center for Addiction and Mental Health, the National Health Law Project, the National Association on Alcohol, Drugs and Disability, National Advocates for Pregnant Women, the National Black Women’s Health Project, the Legal Action Center, the National Welfare Rights Union, the Youth Law Center, the Juvenile Law Center, and the National Coalition for Child Protection Reform. But the kicker for the ACLU is the unconstitutionality of warrantless drug testing by the state, as determined by the US 6th Circuit Court of Appeals in the Michigan case. Michigan was the only state to actually implement a welfare drug testing program, but the appeals court found that the program violated the Fourth Amendment's provision barring unreasonable searches. The persistence of such attempts is drawing concern from the drug reform community as well. Given the fiscal pressures facing the states, legislators could be even more susceptible to pseudo-populist demagoguery than usual. "I am quite concerned that recurring legislative proposals to require drug testing of welfare and/or unemployment applicants and beneficiaries will gain new momentum with the budget crises confronting so many states, and also in Congress," said Ethan Nadelmann, executive director of the Drug Policy Alliance (DPA). "The proposals are mean-spirited, counter-productive and will ultimately cost much more than they save by depriving needy Americans of access to benefits. DPA will do all it can to ensure that these proposals do not become law." "These kinds of laws aren't going to stop someone who is addicted from being addicted," said Richard Wexler, executive director of the National Coalition for Child Protection Reform. "They're just going to drive them further away from getting any kind of help. Also, it is often poverty that causes the stress that helps create addiction. If you make someone poorer, you just deepen that despair," he pointed out. "If you really want to deal with the problem of addiction, provide treatment on demand," Wexler offered. "And if people are worried that not everyone will take advantage of it, let's put that to the test. Make drug treatment immediately available and see if the claim that people will turn it down has any merit." But nobody is offering treatment on demand. Instead, legislators are offering up a stick with no carrot. In Kentucky, a bill championed by Rep. Lonnie Napier (R-Lancaster), HB 208, would require all adults applying for public assistance to undergo drug tests, followed by random testing once a year. The measure would apply to all adults receiving or applying to receive food stamps, cash assistance, or Medicaid. Although Napier told the Richmond Register a positive test result would not necessarily result in the loss of benefits, the bill itself says that a positive test will make the individual "ineligible" for public assistance. "There’s people buying food with food stamps and trading that food for drugs. Children are not getting benefit from it. Children do not need to be in a home where drugs are present," the loquacious Napier told the Register. "Maybe it could get people off drugs. Drugs are breaking the state up. If we could get a few people off drugs, it would be worth it," he said. But Napier's assertion about trading food stamps for drugs appears to be based on little more than hearsay. "People tell me people are abusing the system," he said. "If you knew you were to be tested, you'd want to be clean." Still, Napier's bill has some powerful friends. Among its cosponsors are House Speaker Greg Stumbo (D-Prestonburg) and House Minority Leader Danny Ford (R-Mt. Vernon). In Missouri, Rep. Ellen Brandom (R-Sikeston) is pushing HB 73, which would require a drug test for anyone applying for or receiving public benefits if there is "reasonable cause" to believe they are using drugs. Failure to pass the drug test would result in the suspension of benefits for one year, and the person would then have to apply to be reinstated in the program. Brandom told Kansas City's KCTV 5 that she was doing it for the taxpayers. "They're very resentful that they're working hard, and have to take a drug test to work," Brandom said. "The people who aren't working can receive their tax dollars, and don't have to be held to the same high standard." That bill passed the House Rules Committee on an 11-4 vote last week and is set for a House floor vote this week. A similar measure passed the House last year, but died in the Senate. A welfare drug testing bill has also been introduced in Nebraska. The Chronicle covered it last week; you can read about it here. In Oregon, there are two separate bills aimed at recipients of public assistance. State Sen. Bruce Starr (R-Hillsboro) has introduced SB 538, which would require all people receiving welfare and food stamps to be take a drug test each six months -- at their own expense. A positive test result would result in the termination of public assistance. And state Rep. Dennis Richardson (R-Central Point) has introduced HB 2995, which would require those applying for unemployment benefits to first pass a drug test. Those who tested positive would have to enter drug treatment or give up their benefits. Richardson's bill has not yet been assigned to a committee. Starr's bill was assigned Tuesday to the Senate Health Care, Human Services and Rural Health Committee. No hearing dates have been set. And then there's Indiana. In the Hoosier State, state Sen. Jean Leising (R-Oldenburg) has introduced SB 86, which would require people seeking unemployment benefits to declare on their applications that they will refrain from any illegal drug use. The bill also says that applicants are subject to "penalty of perjury" if they sign a declaration and then are found to be using drugs. Perjury carries a prison sentence of up to three years in Indiana. "In employers' eyes as well as many Hoosiers' eyes, there is something wrong with the system if unemployment applicants are able to receive taxpayer money that may, in fact, be used to purchase controlled substances and lead to them being unqualified to work," Leising said in a press release. "This is an issue legislators need to review." The bill is moving. It passed out of the Senate Pensions and Labor Committee last week. The battle over welfare and/or unemployment drug testing is going to have to be fought again and again. In addition to the states that have bills this year, similar legislation has been proposed since 2008 in Texas, Rhode Island, Missouri, Nebraska, Georgia, Kansas, West Virginia, and Arizona. The impulse to target the poor and disenfranchised remains strong and is made even stronger by the dire fiscal position in which the states find themselves. The bright side is that, so far, that impulse has not prevailed. Carole Bennett, a substance abuse counselor and activist who has lectured at a number of rehabilitation centers as well as schools and universities, offers four healthy concepts to consider when talking to children about substance use.